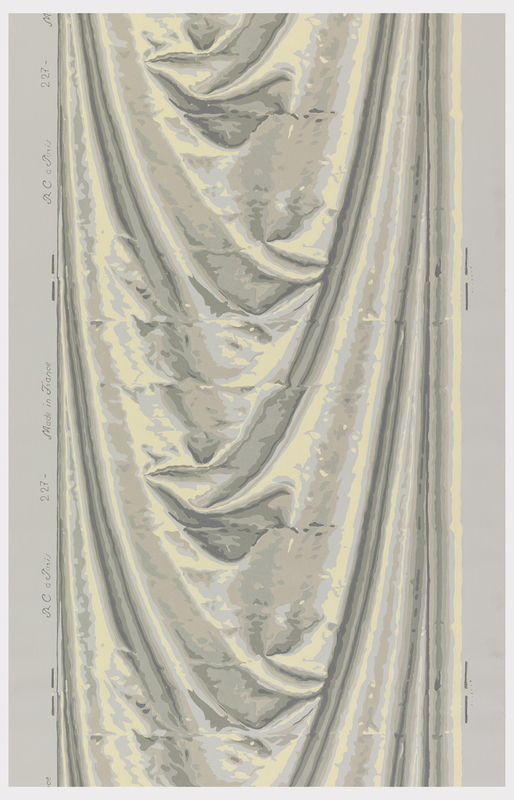 This swishy trompe l’oeil wallpaper is currently on view in the Cooper Hewitt’s interactive immersion room, which is a wonderful place to visit on a dreary February afternoon. This sidewall in particular can trace its roots back to the French Empire Style as espoused by Napoleon’s famed decorators, Percier & Fontaine. Charles Percier and Pierre François Léonard Fontaine originally teamed up while studying architecture in Paris, after which they spent time observing antiquities together at the French Academy in Rome. By 1801 Percier & Fontaine had been noticed by Napoleon, and were appointed as official government architects. That same year the dynamic duo published Recueil des décorations intérieures, a book that historian Cybel Gontar calls “an essential handbook of the Empire style.” In their publication Percier & Fontaine recommended draping walls with heavy silks—a technique the decorators turned to frequently in their renovations of the French royal residences. Drapery-inspired wallpapers were not far behind, and were much appreciated for those without the budget to match their Napoleonic taste.